HARTSVILLE, S.C. – The NOLimit Promotions Triple Crown 25’s wrapped up on Sunday with two huge events at Darlington Dragway. First up was the $20,000 to win Sunday main event which was followed by the Top 64 Points Run-Off for the top points earners throughout the season. In the quarterfinals for the $20,000 to win Sunday race Kevin Pruett made up two of the five remaining spots as he was still alive with his dragster and his Wagon. Also alive at five cars was Robert Vogler in his dragster, Benny Ulmer in his S-10, and S. Johnson in a dragster. Ulmer took out Pruett’s dragster, Pruett’s Wagon defeated the dragster of Johnson, and Vogler had the bye to the semifinals. Vogler ended Ulmer’s run at the semifinal round while Pruett earned the bye round. In the final it was all Kevin Pruett in his wheel standing Wagon as he defeated Vogler to collect the $20,000 victory. The final event of the weekend was the 64 Car Top Points Run-Off where the top points earners for the season faced off for a ton of great prizes including a dragster chassis and a complete racing engine. The final round included the dragster of Megan Lotts against legendary bracket racer Scotty Richardson in his S-10 pickup. Experience won out in the final as Lotts missed the tree allowing Richardson the easy victory. For the win Scotty earned his choice of either a RaceTech dragster chassis or a 598″ PAR BRX racing engine. For more race coverage from the NOLimit Triple Crown 25’s at Darlington Dragway, click here for Thursday results and here for Saturday race results. 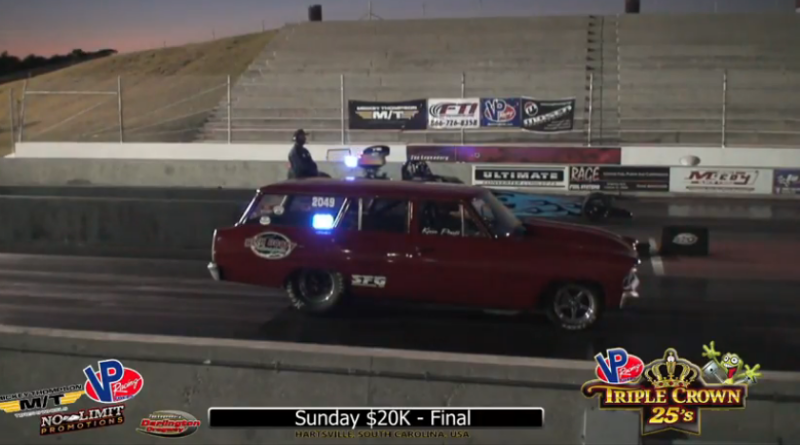 DragChamp is your source for drag race results and bracket racing news. Visit DragChamp daily for the latest bracket racing news.